Standard web 'HTML code is not very good at the enabling absolute placement of images on a page. Normally you're only able to align images left or right with text wrapped around them, or centre them in the page between paragraphs. This can be a problem if you want to add lots of images to a page, as they can't be evenly spaced or in rows, and this results in a messy unprofessional-looking page. To help you avoid this sort of mess, every page on your Spanglefish site lets you activate a 'Gallery' section within it. 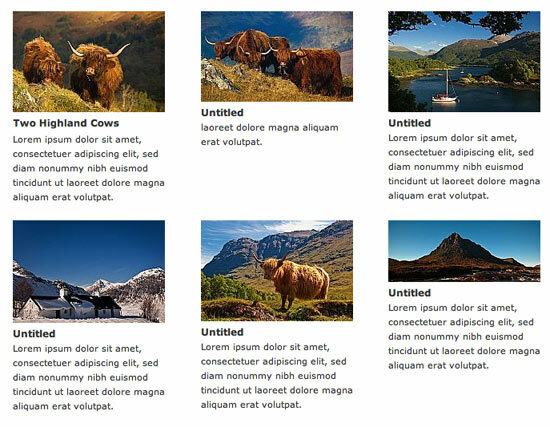 With this facility you can easily add a dozen or more photographs to the page and have them automatically presented in a neat and tidy grid format, and with titles and short descriptions beneath each. In addition, if there is a larger version of the image, then the Gallery facility will automaticallly provide a pop-up 'lightbox' to display these in an elegant interactive manner, with the user able to cycle through the images in the pop-up. So how do you use and edit the Gallery? 1) First, navigate to the page on your site where you want the gallery. Then click on the 'Page Properties' button. 2) The Page Properties controls load, and the third panel down lets you activate a Gallery for the page by clicking on the 'Add a Gallery/Shop' button. 3) Your page will now reload showing a row of empty gallery boxes below your main text . . .
5) Click on the 'Add Item' button, and the gallery on your page will look something like this . . .
Each image displayed in your Gallery grid has it's own control strip above the image. The options there let you edit the item again, move it up or down to re-order the gallery display, or remove it form the gallery. Removing an item does NOT erase the image completely, it simply removes it from the page. Now, the more eagle-eyed of you may have noticed the reference to this functionality as 'Gallery/Shop' and may also have noticed the additional 'Add Paypal' panel included in the screenshot under point 4, above. 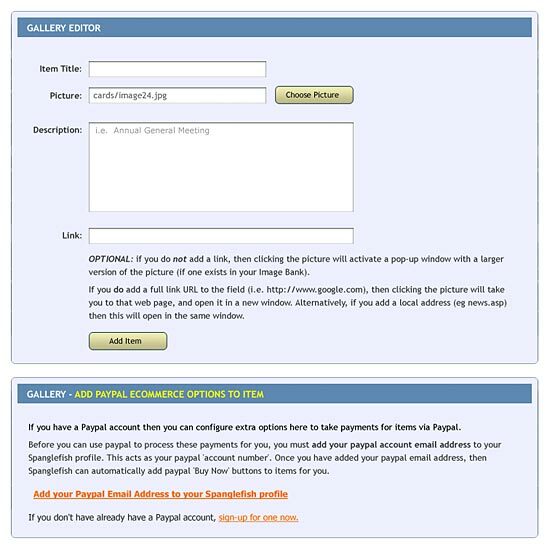 The Gallery facility can also be used to quickly set up an online shop, using PayPal as the payment processor. So, if you already have a PayPal account (or would like to open a PayPal account), then the Gallery/Shop facility can get you selling online really quickly. Learn more about how to set up a Spanglefish Online Shop . . .